What’s Happened to the College Degree? 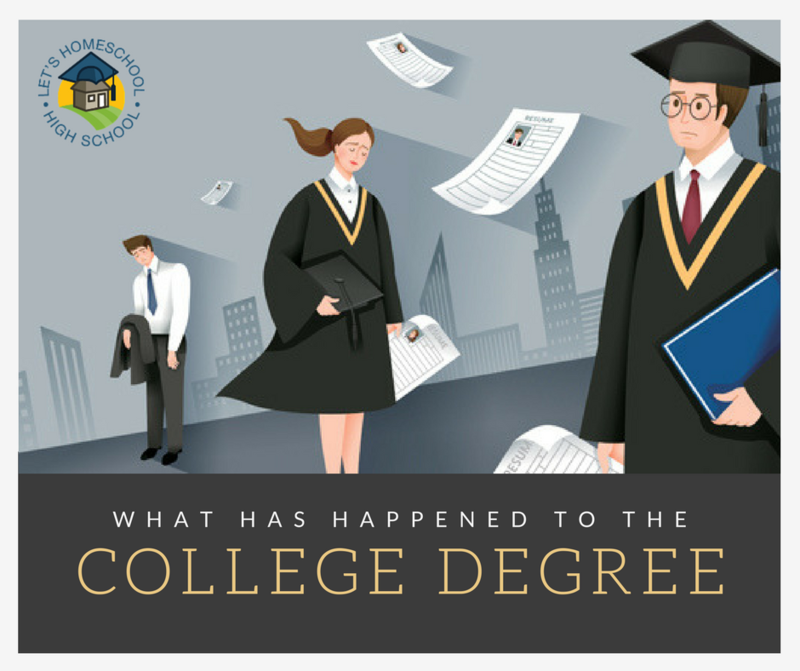 With the ever-rising cost of college tuition, an excess of people with bachelor’s degrees, job scarcity, and the ever-increasing online business opportunities, it’s not surprising that today’s high school graduates are wondering what the purpose of four years of college may be? Sadly, there are some negative side effects to the standardization of college education. Research shows that among young Americans in 2016, 37% had a Bachelor’s Degree while in 2005 only 28% had Bachelor’s degrees. Conclusion: there are more degreed adults in the U.S. than ever before. (1) This has caused an academic inflation requiring ever higher degrees. In times past, a bachelor’s degree was something that set a job candidate apart from others. Yet, almost every candidate has a Bachelor’s degree, which then moves the emphasis up a notch and employers begin to look for Master’s degrees. Don’t believe it? Just stop and ask the janitor where he went to college. Human resource departments just can’t delve as deep as necessary into the individual when there are scores of applicants. Yet, having a degree doesn’t cause you to stand out from the crowd any longer. Typically this made ticking the box of a college degree an indicator that higher level thinking, organization skills, and communication abilities are a given. But sadly, employers are realizing that many students are graduating with degrees that haven’t prepared them for the critical thinking skills that are needed on the job. This is a reflection on some of our colleges and universities as well as professors, but also an indicator that students need real-life training to acquire the skills that jobs require. A college degree no longer guarantees a job. A CNN article stated that only half of graduates age 25 work at a job requiring a degree. (2) In times past the college degree carried with it a professional stigma. However, with degree inflation and the lack of job skills, employers are seeking out alternative ways of discovering a person’s worth. It’s no secret that college degrees are becoming increasingly more expensive, while the earnings for a job requiring those degrees aren’t keeping up. Recent studies show student debt is increasing and students are having more difficulty paying for their loans. (3) Not underestimating the fact that it just doesn’t make sense to start life with tens of thousands of dollars of debt. Common sense would dictate that there must be a more sensible approach to gaining the skills, education, and abilities needed to successfully attain your dream job. College isn’t always the answer. Consider your career choice and find creative ways to be a solution in your niche. There are sound alternatives to college that anyone can explore such as free online courses, freelancing, apprenticeship, and entrepreneurial opportunities. Don’t let the thinking that “it isn’t mainstream” deter you from finding an alternative route to attaining your life goals. Employers are really wanting to see how you can be a solution to their needs. If you can demonstrate that you are the solution, your abilities are what they want, and even give them a taste of how you can help them (free samples are always awesome), you’ll see that a lack of college education is not a deal breaker. Times are changing, and we hope for the better, but a college education may be necessary. If your career choice is a profession that requires a college degree to legally practice then carefully choose an institution that will help you develop the amazing individual you are. Just a few simple considerations will also help you finish college debt free. There is a wealth of information on our site that will help you navigate higher education with ease.